Without traffic the bridge will save about 25 minutes from the journey. Let’s say someone lives in Mishref and wants to work in Silk City. In order for that person to drive to the entrance of the bridge they have to go through the traffic leading to it, which is through Shuwaikh Industrial and the port. This area is already congested and will be more so with everyone passing through to get to the bridge. The same will be true on the Silk City side. In the end, I will be very surprised if the total journey is less that it would be to take the longer detour around the city and the bay. It might seem like the bridge will save about 20 minutes or so from every journey but in order to do so there will be more traffic in the city as a result, having paid KD20 million for each kilometer. The project will be a national disaster. We should not wait for that to happen and we must scrap the project entirely. It is an ecological nightmare, a fiscal disaster and will add to the existing traffic gridlock. A more fiscally prudent and ecologically sensitive solution would be to just use the existing road to Silk City/Subbiya. What’s wrong with that? We don’t ruin Kuwait Bay, we don’t burn KD700 million and we don’t increase the traffic problems in our already crippled city. In fact, we can use the land there to extend the city further. The bridge would slow this down. There are far better uses for the money than this terrible idea of the bridge. I understand that it’s an easy way for some to loot public funds, but i’d rather we find a way without leaving us with a 35 km monster for us to forever deal with. The lines you’ve drawn and used to measure the distances are not very precise. The actual journey’s distance is reduced from just over 100kms down to, 38km, effectively reducing journey time from just over an hour down to 25 minutes. Thirty five minutes might not sound like much but its actually over 50% of the journey. From an economic point, that time is valuable. I’d assumed that the primary function for the bridge is to shorten the journey from Kuwait City to Port Mubarak in order to move construction material during construction of the Silk City and Port Mubarak, and to move goods to and from Port Mubarak after completion. So from a logistical point of view, reducing the turnaround time of loaded trucks by as much as 1 hour per journey could mean they would be able to squeeze in an extra journey at the end of the day. Whats more, how does the installation of an alternative shorter route render the first one obsolete? Once you have the new one, yes it will be used more and the older one less, but just because the 5th ring road was constructed, it doesn’t mean that the 4th ring road cease to exist. Something as simple as introducing a 1KD toll charge for this bridge could control the traffic and in the long run reduce the lifetime cost of constructing it. While you are correct about the shortened distance. I highly doubt that this bridge will make the journey shorter. I imagine it will cause more traffic jams around the city centre and most of the days the whole bridge will come to standstill. The 25 minutes journey you speak about… maybe after midnight during weekdays. Yeah, agreed it’s not precise, but the comparison is still valid. Where do you get 100km from? The centre of the cities? I highly doubt the primary function of the bridge is to help with construction. That sounds crazy. I’m aware that Ashway AlMudhaf was one of the people to bring this project into light and criticize the project in the general public however, i disagree with the procedure that she has taken. She can attest the corruption within the government and its decisions in court, but under the current geo-political circumstances it makes me doubt her motives and comes off [to me] as a major political marketing campaign for herself. This project might need to be reviewed before construction; perhaps more environmentally friendly building techniques and materials can be adapted to have a smaller environmental impact on the bay. It may even be scrapped if it is found to be unfeasible (after the corrupt be held accountable). However, to scrap a project because it is found to be “[not] worth it to begin with” after design, development, and bidding phases are complete, and just before the construction phase is initiated is just as absurd. If that happens to be scrapped, somebody has to be held accountable for the losses that all parties suffered as a result of his/her mistake. I see. But it’s really not fair to start both at that point, though, is it? That’s why I chose the absolute periphery of the city to start both of paths. Maybe a fairer compromise would be to pick a central point in the city and Silk City and plot from there, that way we’re not giving either option an unfair advantage. Either way, the difference will be at most around 30 minutes. That might sound great, but for KD700 million? That’s a LOT of money. It’s also a big risk, ecologically. I just don’t see the point in building it now, especially before the city. Seems like putting the horse before the cart. I agree that it’s probably too late now, but there were lots of people (myself included) that were calling for this to be stopped a lot earlier in the process. I also don’t think we should simply accept the inertia of the process and feel like too much work has been done already to stop it. Could you please explain how a bridge is an environmental problem? All major cities have bridges; San Francisco, New York, Sydney, and of course, London. I never heard anyone mentioning the environment as a major issue. As for the cost, it can be covered by charging drivers a toll for using it. I do believe it’s about time we had another city complete with schools, universities, hospitals and an airport. Kuwait city is getting way over crowded. Yes, build Silk City! I have nothing against that. 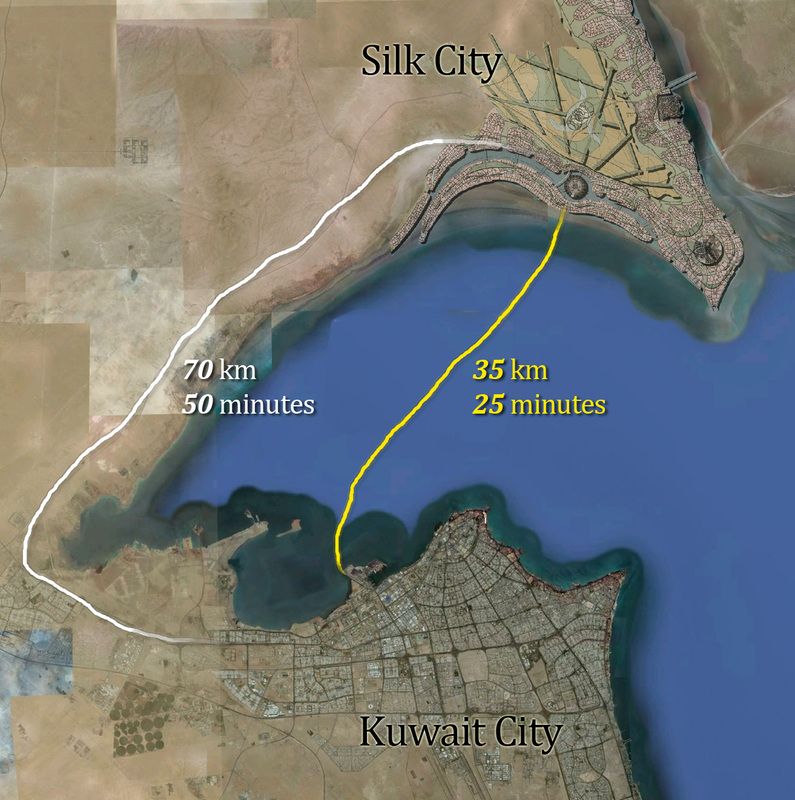 The bridge would have to span Kuwait bay with its notoriously muddy shallow waters. In order for the bridge to be stable they would have to dig really deep piles as well as injecting lots of chemicals and concrete underwater. It’s an environmental issue because of the construction process, not necessarily the bridge itself. Suspension bridges (like the Golden Gate Bridge, or bridges that span the Thames) don’t have columns that penetrate the water. It’s not impossible, of course. But the question we have to ask is if it’s worth the environmental and financial cost. Sure we can have a toll booth, but that will never pay back the cost of the project. All of the “I don’t give a crap” locals and the foreign workers that have adopted the local “I don’t give a crap” additude about trash could be counted as the enviromental impact! They are always throwing crap out their windows while driving down the road, to include the police as well! The EPA have evaluated the bridge and it has concluded that it would be an ecological genocide to have the bridge. 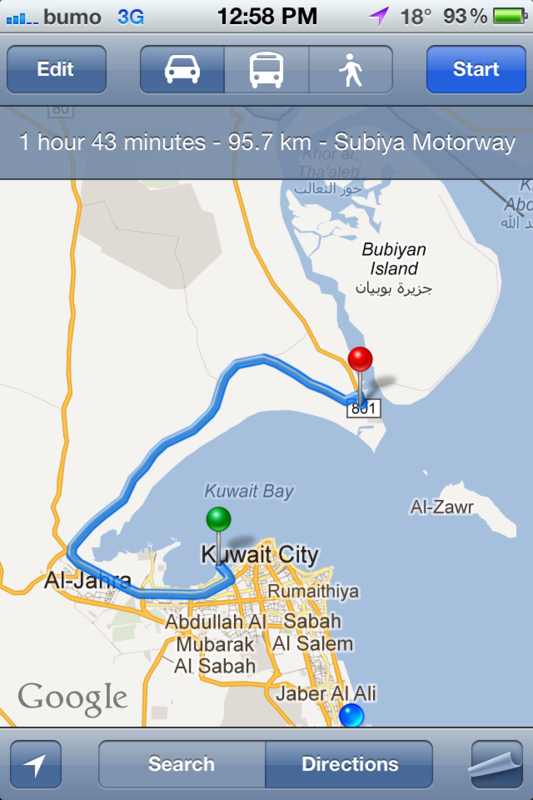 Remember, Kuwait bay is nesting ground for many special Kuwaiti sea life. Yes we can… and we will. We are the nation who burned $15,000,000.00 in less than half an hour just to have fireworks. We are the nation who supplies energy to the developed world, yet cant meet its local demand on electricity during the hot summer periods. We are one of the wealthiest nations in the world, yet we have aprox 120,000 families homeless. Husbands and wives in their 40s and still live with their parents. Younger people have given up on the dream of owning a property. We are probably the only nation in the world that refuse to have a second or third public University. The only nation in the world that does not have a grants or scholarships schemes for those who wish to pursue postgraduate studies in Science or Engineering. We are the nation, who in less than a week… been described as the State with most retard economy in the Gulf, the world fattest country, and the world top country in cars accident fatalities. So the next time you try to bring logic or good argument points on the table remember very well… we can do the unimaginable. While I agree wholeheartedly with the points you make, I don’t share your pessimism. The system that we live in creates the incentives for this kind of mentality and abuse, and there isn’t going to be any sudden changes to make that system better, but I do believe we are moving towards it slowly but surely. It’s inevitable. People are getting fed up about it and a critical mass of them are being less susceptible to the bribery of cash for acquiescence. Also, thanks for the comments and the passion. They should cancel the project and instead of making other targee3at and instead spend the money on building a COMPLETELY new city west of Kuwait and new highways! they are using land that’s further away but that just caused the 6th ring road to be hell most of the time. Has there actually been any progress on Silk City? Or is it just the same old talk we’ve been hearing for years? Mr Barrak, When the bridge is completed, don’t use it. You are welcome to use the long route. 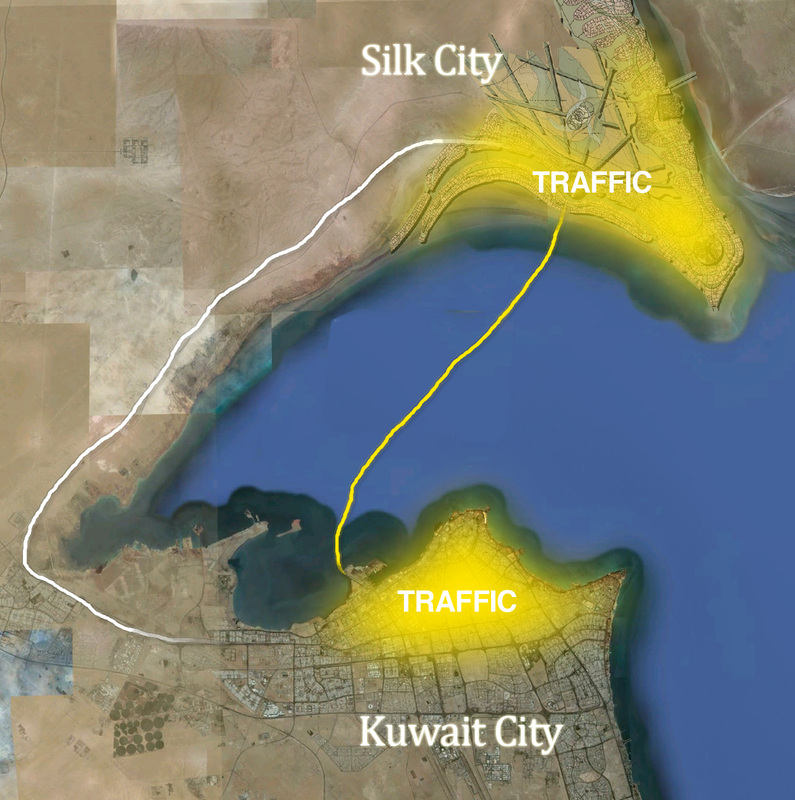 I, on the other hand, am looking forward to live in Silk city, if it is ever constructed that is, and I will happily use the bridge to cut my daily commute to work in Kuwait city and back by almost an hour every day. Mr Sami, if this was built on private land using private funding, then I’m with you. But it’s not. This is a publicly funded project on public land. I have a right to voice my criticism and so do you. All the points you’ve made I agree with Barrack. On an ecological standpoint, this project will leave devastating footmarks in nature during and post construction. On the topic of sustainability, Kuwait lacks to provide maintenance on all public projects so the bridge will slowly deteriorate in quality unless private companies “adopt” it (advertisements for maintenance? ); I also doubt they’ll be using materials that are eco-effective. I try to stray away from complete negativity when it comes to Kuwait because I AM studying abroad on their payroll after all (they’re doing something right for their citizens I guess), but that doesn’t mean I should remain silent as the country is slowly imploding. Rather than being patriotic and defensive, we should all be objective and explore alternative options. Barrack I noticed you’re an architect, I’m currently an architecture student. This project is making me cringe! will play a major role into cuting the distance by half and its an important part of Silk City. loads plus other calm drivers will still use the old route. there so don`t worry about the traffic, in the long run Specially Expats. amazing ? lets coun`t it as an alternative route too which means even lesser traffic. I Totally Disagree with You, i will tell you why, first of all instead of telling them to scrap it you should try fixing it instead by giving new ideas, like for instance, building a metro on a 38KM Road will make that 25 Minutes gone in 10 or 7 Minutes, so you slashed that time into half, second thing, why not build Parking Buildings around that starting/ending areas, so people will Park their cars there, and then head toward Silk City or vice-versa, am sure they could work out a neat MonoRail over there too, At This Point we reached Perfection, Damn it Lazy Kuwaities,and yet they complain about their FAT problems, a funny nation in every scene lol, please tell me we all need our cars over there, then why the hell did they call it WORK, your there to do your job and come back thats it, the same story goes for the people whom lives in Silk City and they work over at Kuwait City, they leave the car at Kuwait City and Ride the Bridge Metro heading home, if we have a Metro over Kuwait City Side that problem will be solved too, anyway so lets talk about the environmental problems, i really dont know what youre pointing at exactly but believe me theres bigger environmental problems than this project alone, remember mishref incident when they dumped the waste into the sea, this Alone is a bigger crime against environment than the bridge itself, so Let them fix the other problem first then complain about the bridge, if youre so worried about the environment at 1st then there won`t be Shuwaikh Port Won`t be Ahmadi/Shuaiba/Mina Abdullah Refinaries, and there won`t be Money too, oh and to make that fair enough, why not use New Technologies on Silk City why not make it rely on Solar Power most of the time, why not build a Gigantic Solar Power Station, and help save the environment even more, all street lights over there should be solar powered, Wind will make it during night and sun will make it during day, alternative power sources are always welcomed everywhere, but i hope things will go as planned That Silk City rely on its own it will have Its own Airport its own Sea Port to let it get separated from Kuwait City which is the main Idea in 1st place. 1- The Bridge will play a major role into cuting the distance by half and its an important part of Silk City. 2- The Very Very Heavy loads plus other calm drivers will still use the old route. 3- The more famous it gets half of the people will be shifted there so don`t worry about the traffic, in the long run Specially Expats. 4 – Last but not least lets not forget that people can still access the City By using the Sea too, imagine a boat trip on the weekend to Silk City isnt that amazing ? lets coun`t it as an alternative route too which means even lesser traffic. I do believe in myself. However I don’t understand what you mean by “believe in your country”. My country has been feeding all of us for the past fifty years. All we had to do is dig a hole and cash would flow into our bank accounts. You know what we did to those holes? We shat in them. Don’t blame the retardation that we see over the country. I wouldn’t give it development credits either. The country is what we make out of it. We can make it Pearl of the Gulf or the world most corrupt city. Now the question… do I believe in my fellow Kuwaitis? I believe that we are good people. We are educated, hard working when given the opportunity, very optimistic considering the reality in hand, and peaceful. Yet all of this is going to waste without the government bothering to utilize it. I am not being pessimistic. I’m simply realistic. If I tell you you’re going to die, its a fact. We are all going to die one day. You can spend the rest of your life crying about it or enjoy each and every moment of it as if there is no tomorrow. What I see today is lack of vision at all levels, be it legislators and government. Actually… lack of vision is least of it, but I’m not in a mood now for talking about this further. Let us just say… there is lack of “interest” in moving this country forward. This bridge, is just one example that shows the level of apathy they have towards our future. Wealth distribution… between the selected few. Not my word, opposition words. They probably want a share too… but then again, this is what they implied clearly. 700,000,000.000 Kuwaiti Dinars… you know what that means? 18,000 opportunities for bachelor degree studies at world TOP Universities. 35,000 opportunities for masters degrees studies at world TOP Universities. 24,000 opportunities for doctorate degrees studies at world TOP Universities. But probably the government doesn’t want so many educated people… they cause “burden” over the government budget after their graduation! So here is another idea… invest in water technologies since we are the only country in the world that is 100% dependent on its desalination. Or maybe invest it in road safety considering we are world largest road fatalities. I can go on for ever telling you why 20 minutes is not worth 700,000,000.000 Kuwaiti Dinars and there are other things much more worth it. You talk about faith? Tell me what faith should I have if my government sole role is depriving its citizens from their basic rights of living in a home, driving at a road safely, drinking clean water, having electricity, insuring education for their children, and getting a decent job. Everything we hear and read and sometimes persuaded to participate in is just political games… for those with pockets that never say “ENOUGH”. Yes because they take action as The Government but after all they are normal people but they prefer their personal matters rather than Kuwait ones! Barrak I for one totally agree with you. There are many important issues that I would rather see addressed today rather than 40 years from now. This bridge, which I must confess just found out about today from your blog via 248am.com by accident, is an odd development. Boss: Honestly, while I respect your opinion, I disagree with you. But lets look at the socio-economic impact of all of this. The article I am referencing too discusses the new nationwide garbage collection contracts. There are multiple references to the “behavioral pattern” which is referring to the “I don’t care” attitude that a large mass of people adopt in this nation, both Kuwaiti’s & expats. So in this case Osama Al-Duaij clearly states that people simply dispose their waste everywhere, its the social norm, to the point where its impacting the nations ability to keep the country clean. So the ministry of public works solution to this is to pay 300 million KD over 5 years to offset this “behavioral pattern”. Now here comes my main point: We try to fix every problem by dumping “much more” cash into it. But without fixing the root cause, and hence it just turns into an endless expense. The root problem ladies and gentlemen is “The Absence of Law”. The article references that Kuwaiti behavioral patterns are not seen in the west, because in the west its illegal to dump waste wherever you feel like it. And the fear of fines, the law enforcement, and jail time, is what keeps the masses in check. Education, and good moral values do help, but are not, and have historically never been the driving factor in such issues. If the EPA evaluated the bridge to be an ecological disaster, if we had a strong and mature legal system that is actually “enforced” and monitored, this bridge would never have been built in its current design. create a problematic situation for the corrupt politicians that are embezzling state wealth. Our government educational institutes are oozing with corruption. Money gets pumped in, but no one can see “tangible” investments. Personally I wish for a “wasta-free” Kuwait, one that has reasonable laws which are enforced at all levels, comparable at least to Dubai, that would be a great start. The absence of law enforcement, I believe is the root cause problem for practically any issue you could come up with. A university project in Kuwait has started which involves raising awareness to the local community through instagram. We as a society need to change a lot of habits which are impacting the local environment and health. Instagram has become a great tool to express creativity and share how we view the world around us. Your website has been shared on http://ekwti.blogspot.com/ to inform followers of your work. Please feel free to visit and get involved! the bridge is soon finish ? Any updates on the project?